Trampling Stampede! Tauros, Pokemon One a Day! The Hall of Bulls. Located in France, the caves in Lascaux house paintings on its rocky surface; these are some of the oldest works by our ancestors recorded to date featuring animals with mineral pigments. 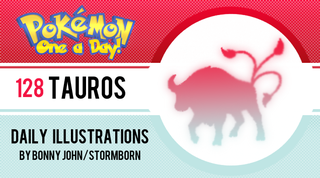 The Kalos region, representing France, is the absolute best coincidence I could ever have dreamed and connected to parody those cave paintings featuring today's Pokemon illustration for the day - Tauros! Tauros is a pretty boring design. He's far from interesting in my eyes - he's largely a bull...and that's that. Got some weird metallic bling on his head, a mane, and three tails acting as a whip of sorts to put himself in a frenzy. Don't get me wrong - I think Tauros is a better design than Bouffalant - but the point is that i feel this Pokemon is one of the most generic in designs that reflect it's real world counterpart. That's what helps sell this piece even more than usual, I think! Today's piece is drawn and stylized after the cave paintings seen at Lascaux - sweeping, arching lines, overlapping creatures, variations in markings and of course the figures sitting against a rocky surface. I did my best to add in the Tauros details, like the metal bumps down its forehead, the rings around the base of the horns, the manes, and the three tails. I tried to create a sense of controlled chaos based on theories of the paintings themselves. The main and most important thing that I kept in mind was the various artists or works painted over each other's creations over time. Silhouettes come and go in this piece; the individual Tauros appearing as a heard or one large entity. This I thought became an awesome coincidence in reference to Ash catching a plethora of Tauros in an unaired episode here in the states. I struggled most with trying to figure out a way to frame the cave painting to finish things off - I played around with having it sit inside a silhouette of Tauros, then an ornate frame as if it was kept at a museum (taking liberty with that concept), and a more tighter frame that broke through clean edges that encapsulated details jumping out of the frame such as the tails and the horns. Eventually, I would do something a lot more simpler. I would frame it against the border that is the default for the One a Day, and put in a nice little label to add to the authenticity and nature of the artwork. A lot of liberty has been taken here so bear with that haha...This label situation might've worked better for Machoke earlier on but this will have to do! I'm content with the piece, and hope you enjoyed the French connection the piece with the Hall of Bulls and Kalos region rendition of the Lascaux Caves! Thanks for looking and enjoy your weekend!